12 Dicembre 2017 | in English. A text written for three No Tav comrades which were arrested last saturday during an action against the great work's construction yard. Now they are out of jail, with mandatory residence and sign-in at the Police Department in their hometowns. On December 8, 2005, fifty thousands of No Tav activists reconquered Venaus town, fenced and occupied by police in order to implement the TAV construction yard. Twelve years later the movement does not give up reclaiming its valley against the devastation brought by this useless, costly Great Work. On December 8 night, hundreds of No Tav activists, women and men being both young and “aged”, came back to the Tav construction yard in order to make their voice heard. Anniversaries are important when they do belong to a collective history where one does not give up fighting for what is right, where there is no surrender in fighting a work that symbolizes the mafia of politics that devours the collectivity’s resources. While a great part of the demonstrators got their way blocked by a jersey reinforced with the famous Israeli barbed wire, some other small groups defied the Val Susa night chill in order to toil up the trails and reach the fences set to protect the geognostic tunnel. The construction yard then was attacked from many sides with shears and fireworks while the police unsuccessfully tried to disperse the No Tav demonstrators there by throwing stones and tear gas. 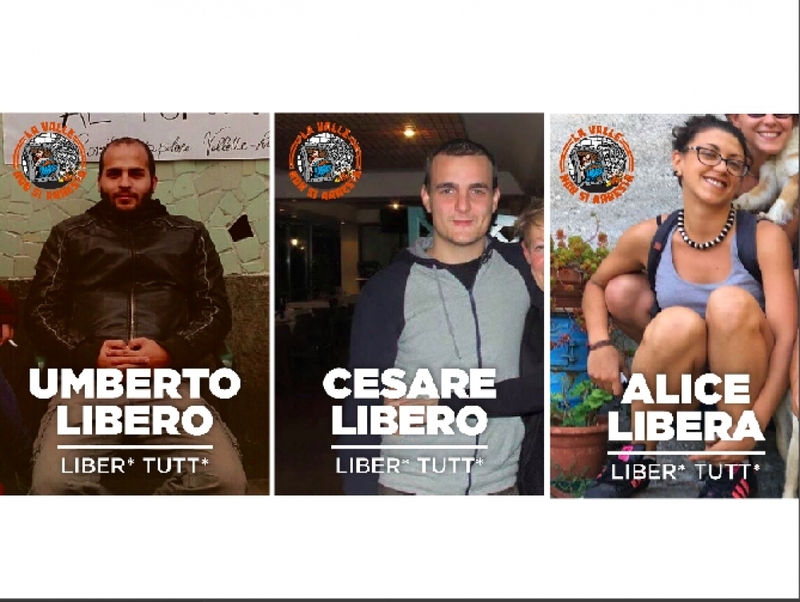 Political police though, being in hiding goodness knows where, managed to stop close to the fences two boys and a girl: Alice, Umberto e Cesare. Today the press describes them as most dangerous thugs. We care about telling you who they are. Not for the sake of any kind of fetishism about their characters, but because they are comrades of ours and we love them. Umbe and Alice are two students that, through the years, always had to get by in order to fund their education. Driver, waiter, painter, warehouse worker, clerk and everything that the wondrous world of labour in Italy reserves to young people. In spite of this, they always found the time to get involved in Turin and Val Susa on the side of those who struggle, in the neighbourhood committees, at the anti-eviction desk, at the mass market retail workers’ pickets or in the university. Cesare is a young workman of the Piaggio satellite activities from Pisa that firmly fought a year ago along his factory colleagues against the blackmail of temporary contracts that, in order to satisfy the big companies’ interests, forced him to unacceptable working conditions and permanent precarity. They are three sons of Val Susa, who grew up on the paths of the Valley and fell in love, demonstration after demonstration, with a territory being threatened by a wicked and senseless work. Today the press cares to specify their name, surname and residence. They are not rapists deserving discretion and initial letters. They are not politicians enjoying presumption of innocence. They are only three youths that decided to struggle. A vile act being carried on under directions by DIGOS political police, an extra-judicial revenge played out by a band of cowards that thereby hope to prevent three young workers from finding again housing and a job. But what we do – both in the day or in the moonlight – was always done with our heads high, with the serenity and the obstinacy of those who know that things in this country will change when all of us will start to fight for what it is right, instead of bowing down. The press then, also in this case continues its dull operation of labeling as “Askatasuna social centre leaders" the comrades being most active and generous through the latest years’ struggles. Evidently to get involved in politics without getting appointments, without looking for exposure, a seat of power or personal profit is something inconceivable for these people. Simply, in the age of hypocrisy elevated to being an universal value such an anomaly is unsustainable for those in charge. We are sure that our comrades, if they were not shut behind bars, would tell us to carry on even today, being convinced of our reasons. Neither for recklessness nor for calculation but because, as the No Tav movement taught us through these years, we now know that A SARA DÜRA (“it will be hard”)!